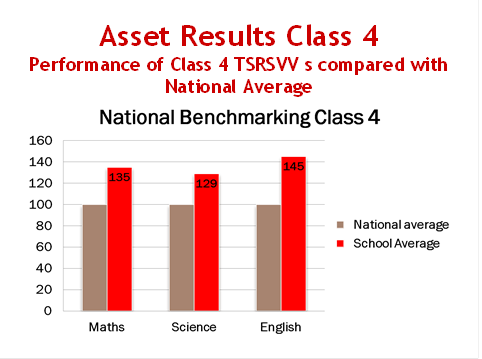 Students of grades 4 & 5 take the ASSET (ASSET stands for Assessment of Scholastic Skills through Educational Testing) which rather than testing how much a student has memorized, focuses on measuring how well a student has understood the concepts taught. Students are tested on concepts through Multiple Choice Questions on various subjects. The ASSET provides useful and insightful analysis on learning patterns for individual students. Our students have always done us proud here. 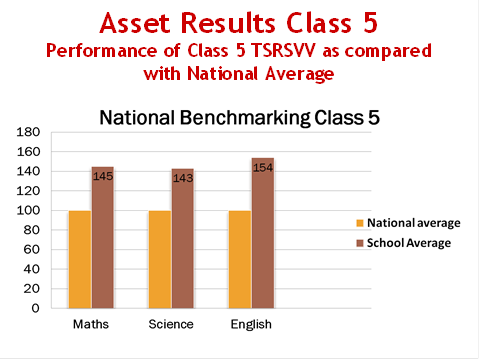 A comparison of ASSET results (for three subjects) for the test undertaken by students of grades 4 & 5 this year with the national average is given below; you can also access the ICSE/ISC results as well as the IB results through the links given below.